Our survey vessels are designed to support all common types of hydrographic and environmental monitoring equipment. Multiple power supplies, mounting systems and lashing points are provided to make mobilisation of clients' own survey gear as easy as possible. 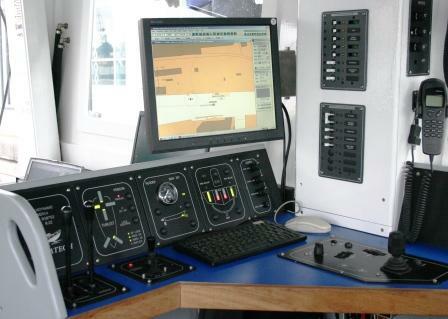 When chartered to hydrographic companies, data is collected and stored on clients' own machines. Much of our recent work has been benthic and epibenthic monitoring using our own sediment grabs, beam trawls and underwater imaging equipment. For this type of sampling we supply a complete package including survey grade DGPS connected to embedded computers running survey planning and logging software. Data recorded in the survey PC include: unique fix number, sample ID, time/date stamp, sample co-ordinate with lay back correction from antenna, sample description, speed, heading, water depth and digital image of recovered sample or seabed site. Data are presented as .txt / .xls / .jpg / .dxf / .dwg and may be emailed from the vessel or supplied on CD later. We recommend that clients on board keep their own paper record to backup the digital data provided. A labelling machine is available on board to assist with sample tagging. In addition to the built-in survey PC there are two other processors dedicated to electronic chart plotting, track logging and dynamic position control. All instruments are discreet, and some critical components are duplicated ('Aquadynamic' has two DGPS receivers in addition to the survey DGPS), but all data is shared throughout the system. 'Aquadynamic' also logs all engine data in electronic control units and diagnostic software is installed to perform various engine management tasks. Purpose-built software is also used to monitor the hydraulic sampling system, display the depth of the camera or sediment grab in relation to the seabed and automatically log co-ordinates as the sample or image is taken.